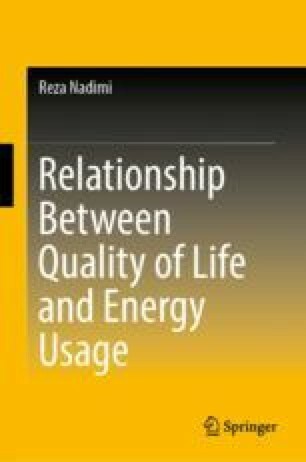 Previous chapters conducted energy analysis in terms of the proposed QoL indicator at international level. Moreover, the analysis of Chap. 3 revealed that QoL will increase three times if final energy consumption per capita reaches to 548 kgoe. Additionally, poverty rate decreases around three times through supplying same final energy for each person in pre-developing countries. Energy consumption at family level is the scope of current chapter, to measure fundamental energy needs (FENs). Then, it will investigate to what extent FENs reduces final energy consumption. In other word, the share of FENs in energy poverty reduction is considered. The proposed method is based on time use analysis which is independent from place and families. Thus, the proposed method can be conducted in different countries and different families to extend the results. Measuring FENs across households provides an insight into the poor households’ energy needs and energy poverty reduction. Household’s fundamental energy needs consists of energy for heating, cooling, cooking, and lighting services, which vary from one country to another. This chapter proposes the time use analysis to figure out energy consumption among households, while the “power” side of energy is assumed as an exogenous variable (Energy = Time × Power). A set of household activities related to a family with two persons is selected and their corresponding cycle times and frequencies are modeled by different statistical distributions due to the intrinsic uncertainty of cycle times. Then, a simulation model is created to extract robust results related to the household energy consumption based on the whole set of activities, weather data and selected statistical distributions. For the aforementioned family, the results of simulation showed that on average, the daily FENs is 63.3 MJ; while its highest share belongs to the cooking activities (39.2%), followed by heating (23.6%), cooling (18.3%), and lighting (5.2%). The results of chapter emphasize the importance of heating, cooking, and cooling services for poverty reduction at the household level than lighting service.